Endocrine Surgeons: Insoo Suh, M.D., Jessica Gosnell, M.D., Orlo Clark, M.D.,Quan-Yang Duh, M.D.,and Wen T. Shen, M.D., M.A. 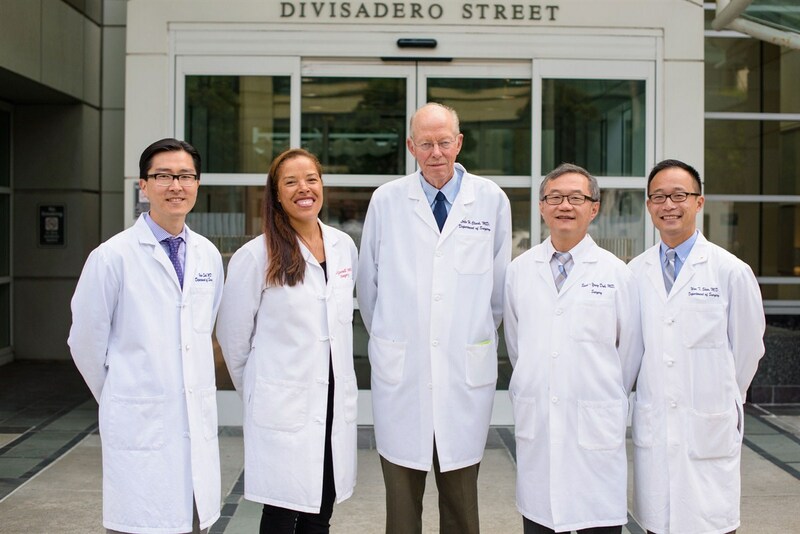 The UCSF Department of Surgery has a long tradition of excellence in endocrine surgery spanning more than 50 years. The Endocrine Surgical Oncology Program was established in 1990 by Dr. Orlo H. Clark to advance our three-fold mission of providing compassionate care, performing innovative research, and training the future leaders of endocrine surgery. Endocrine Surgery is a specialty of general surgery devoted to the surgical treatment of diseases of the thyroid, parathyroid, adrenal, pancreas and other endocrine glands. Operations are performed to treat benign and malignant tumors of these glands or to treat excess hormone secretion from them. Pancreas (insulinoma, gastrinoma, neuroendocrine tumors of the pancreas). We routinely use minimally invasive surgical techniques, including minimally invasive parathyroidectomy and thyroidectomy, laparoscopic adrenalectomy, and laparoscopic pancreatic resection. UCSF endocrine surgeons treat more than 1000 patients a year. We have extensive experience in the diagnosis and treatment of both common and rare endocrine diseases and therefore achieve high success rates with low complication rates. We work closely with world-class endocrinologists, radiologists, oncologists, and pathologists to provide the highest quality of care for our patients. Our surgeons are actively involved in basic and clinical research, including the most innovative clinical trials . Our research is aimed towards improving our abilities to diagnose, localize and treat endocrine diseases. Our Clinical and Research Fellowships are integral components of our Program. Our clinical fellows, working closely with UCSF surgical residents and medical students, help us to provide the highest level of care for our patients. Our research fellows seek to gain new understanding of endocrine disease in order to improve the practice of endocrine surgery. We have trained more than 100 fellows in both the clinical and laboratory settings, and many of them are now leading endocrine surgeons in the United States and around the world. Through our multidisciplinary approach and our dedication to excellence in research and education, the UCSF Endocrine Surgical Oncology Program strives to provide the most innovative and compassionate care possible for patients with endocrine diseases.